It is believed that slots after paying jackpot need to turn cold in order to provide players with the payout. It is actually a false belief as slot machines after a big hit continue to pay out at a standard rate. The matter is that all playing sessions are powered by Random Number Generator (RNG) that makes all games random. There is the opinion that those people who possess casino club card definitely decrease their chances to win big. It is absolutely not plausible statement as such card, on the contrary, are made to encourage people to play in a certain casino. And if casino card owners are not paid well, they will certainly not have any desire to be involved in playing in such casino. Casinos want their permanent players to continue play, so they wouldn`t decrease their players chances to win. It doesn`t matter what sort of payment is used as slots are totally powered by a random number generator. Moreover, casino club card is useful because you are offered additional kinds of bonuses. Again it is a false statement as it is next to impossible to determine whether a slot machine is about to hit or not. Every spin is a random occurrence and it doesn`t matter what was before! If you play for a pretty long period of time and do no win, you`d better quit playing as it may be really devastating to your bankroll. It is not true. Slot machines can`t be influenced by temperature of coins inserted. You may play any coin: cold, hot, old, new or whatever, it doesn`t influences the game outcome. By doing so you may just be eliminated from a game and even fined for doing such things. 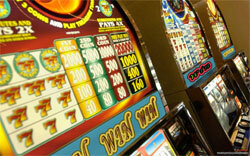 It is believed that loose slot machines are located at the entrance of casinos or on the edge of aisles. Yes, a long time ago it was so but not now. Every casino has its own tricks of slots placement and you can`t say for sure where the loose slot is located. If you want to know this for sure, is to play all of them in a certain casino but this will not guarantee that you will definitely know what slot is loose.